Filmscreening "Syria: The Impossible Revolution"
Berliner AktivistInnen laden ein zum Filmabend “Syria -The Impossible Revolution” mit anschließender Podiumsdiskussion mit den Regisseuren und AktivistInnen aus Syrien am 28. September 2018 im Kino Moviemento in Berlin. Berlin activists invite to the film screening "Syria -The Impossible Revolution" followed by a paneldiscussion Q&A with the directors and activists from Syria on September 28, 2018 at Moviemento cinema in Berlin. Jetzt Tickets kaufen! / Buy tickets now! Der Dokumentarfilm, erstmals in Deutschland zu sehen, zeigt die Entwicklung der syrischen Revolution, die als gewaltloser Aufstand breiter Teile der Bevölkerung gegen eine der ruchlosesten Diktaturen begann und in eine Katastrophe mündete. Das Assad-Regime und seine Verbündeten wussten den Forderungen nach Brot, Würde und Freiheit mit nichts anderem als brutaler Gewalt zu begegnen. Der Film verfolgt die Entwicklung seit Beginn der Herrschaft der Assads bis hin zum Fall von Aleppo 2016, wobei Archivmaterial und Interviews mit unterschiedlichen Menschen, die direkt am Aufstand beteiligt waren, ebenso zum Einsatz kommen wie die Stimmen von Experten. 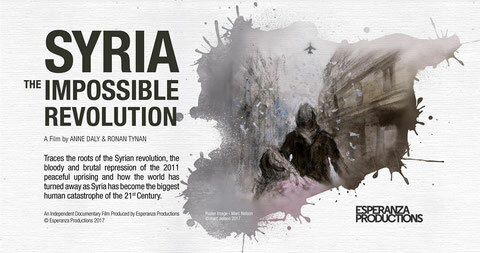 The documentary, first seen in Germany, shows the development of the Syrian revolution, which began as a nonviolent uprising of broad sections of the population against one of the most ruthless dictatorships and resulted in a catastrophe. The Assad regime and its allies responded to the demands for bread, dignity and freedom with nothing but brutal force. The film follows the evolution from the beginning of Assad's reign until the fall of Aleppo in 2016, using archive footage and interviews with various people directly involved in the uprising, as well as the voices of experts. The role of various supraregional and regional powers and the question of solidarity with the Syrian revolution and a population that was and is exposed to massive bombing, starvation sieges, displacement and the terror of various militias is also highlighted. The question of why an "anti-imperialist left" could not decide on solidarity with an uprising that is as legitimate as it is inspiring is critically examined. 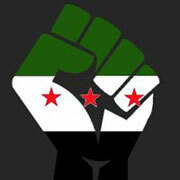 Afterwards, the director and one or more of the Syrian revolution participants will discuss with the audience these and other issues raised by the film. Esperanza Productions ist eine preisgekrönte unabhängige Produktionsfirma und wurde 1995 von Anne Daly und Ronan Tynan gegründet. Das Unternehmen hat im Laufe der Jahre eine Reihe von bedeutenden Preisen gewonnen, wobei Tynan und Daly 1999 den Fernsehjournalismus des Jahres für "Dropping the number 10 for Dili" erhielten. Im Jahr 1996 erhielten sie den National Television Broadcasting Award für "When Happiness is a Place for Your Child". In jüngster Zeit wurde "Mother Against The Odds" beim Filmfestival Fingal 2013 für den besten Dokumentarfilm nominiert. "Esperanza Productions is an award winning independent production company and was founded by Anne Daly and Ronan Tynan in 1995. The company has won a number of major awards over the years with Tynan and Daly receiving the Television Journalism of the Year Award in 1999 for Dropping the Number 10 for Dili. In 1996 they won the National Television Broadcasting Award for When Happiness is a Place for Your Child. More recently Mother Against The Odds was shortlisted for Best Feature Documentary at the Fingal Film Festival 2013." Wir danken insbesondere unserem Partner, dem Kino Moviemento, für die gute Zusammenarbeit! We especially thank our partner, the Moviemento cinema, for the good cooperation!